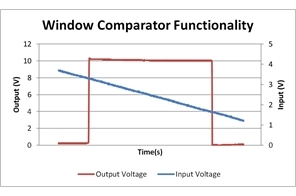 This window comparator reference design features the TLV1702 operating with a single 5V supply. The output can be pulled up to as high as 36V due to the open-collector output of the TLV1702. 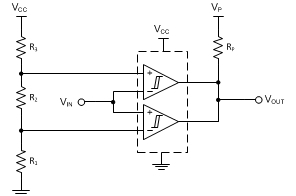 Three resistors are used to set the window voltages. This reference design includes theory, error analysis, component selection, simulation, PCB design and measured data that correlates with the simulation.